This test is designed to give you feel of an actual Google AdWords Shopping Advertising Exam with questions on most important topics and features of Adwords. Please take this test seriously as it can help you pass the Google AdWords Shopping Advertising Exam. Try to finish the test in limited time period, We recommend to spend a maximum of 1 minute per question. This test contains multiple choice questions. There can be question with more than one correct answer. Congratulations - you have completed Google AdWords Shopping Advertising Exam Practice Test . 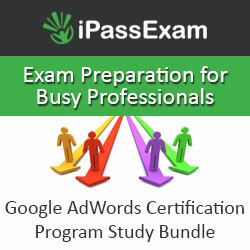 For more questions we highly recommend the Google AdWords Certification Exam Study at iPassExam. It is a very current and comprehensive resource designed specifically for Adwords preparation. Tarun has just finished adding products and attributes to her new data feed. Which of these is a preparation step that should be followed for submitting the feed? Decide whether you're creating a test feed or a standard feed. Standard feeds create items eligible for Google Shopping results while test feeds do not. You can use test data feeds to check and fix any processing errors and warnings before submitting the same file as a standard feed. An advertiser will be charged for a click on their Product listing ad under which of the following circumstances? We only charge for clicks on Product Listing Ads that lead directly to a merchant's website. This includes clicks on Local Product Listing Ads that link to merchant websites hosted by Google. You aren't charged for clicks on Product Listing Ads that lead to pages within the Google Shopping website. Which of the following methods will be used to communicate a policy violation issue found in Google Merchant center? Google will use your listed technical contact to reach out to you regarding data quality or policy violations, so please make sure this is current. Prithvi is viewing his Product tab for his Shopping campaign and can see the status ‘Not yet searchable’. Which of the following statements provide a reason why Prithvi is seeing this status? Your product is currently in the process of being added to results. Products submitted through a data feed will be searchable within 24 hours.Note: Products marked as 'out of stock' in your data feed will also have this status and won't be displayed in results. What is the purpose of ‘Campaign priority’? Campaign priority: Use this optional setting when you have multiple campaigns advertising the same product and you want to determine which campaign (and its associated bid) will be used when ads for these products show. We recommend prioritizing only a subset of the products you want to promote, such as items featured in a special sale, by combining a higher campaign priority with an inventory filter (explained below). This allows you to easily manage bids on these items during the sale period. Simran's data feed contains a large number of products, and availability and pricing of these products can change many times during the day. Which of these options provide an appropriate solution to help maintain accuracy of data for the product feed? If the prices and availabilities of your products change very frequently such that four updates per day are not enough to meet our quality standards, you will need to use the Content API for Shopping. It allows you to provide updates for individual items, and update your data to Google Shopping almost immediately as soon as the product information changes in your own system. Shopping campaigns use product groups to determine when items in your Merchant Center account appear on a search results page. You create these product groups from the Product groups tab in AdWords, where your entire Merchant Center product inventory is made available for you to subdivide by levels of product attributes such as category, product type, brand, condition, item id, and custom labels. You can use up to seven levels of product attributes for each product group. You can then set bids for these product groups according to your advertising goals. How long can it take for Google Merchant Center to review your product data feed once it has been submitted? Note: If you submit your items for the first time to a particular target country for Google Shopping, it may take up to 3 business days for your items to be reviewed. To prevent delays, make sure your feed conforms to the products feed specifications and the Google Shopping Policies. Which of the following cannot be changed in Google Merchant Center after it has been submitted? The country or territory that you selected when you created your Google Merchant Center account cannot be changed. You must verify and claim your store’s website URL before uploading product data to Merchant Center for Google Shopping? Before you can upload product data to Merchant Center for Google Shopping, you must verify and claim your store’s website URL. Verification lets Google know that you are an authorized owner of a website URL. Claiming associates the verified website URL with your Merchant Center account. Google uses the business information you submit to display to users who view your products online. Business display name: The name of your business or store. The business display name must adhere to the store name guidelines and is displayed on your ads. Website: The domain that hosts your products. Your URL must begin with http:// (or https://) and include your full domain name. Business address: The location of your headquarters or where your business is registered. Primary contact: The primary contact information for your Merchant Center account. Updates regarding your Merchant Center account as well as feed errors and warnings will be sent to this email address, unless indicated otherwise. Your contact information won’t be displayed publicly. Technical contact (optional): The technical contact information for your Merchant Center account. This point of contact is used to send updates (as indicated) following data feed processing. Your contact information won’t be displayed publicly. Customer service contact (optional): The customer service contact email, url, and number from your website. When verifying and claiming your website URL, you will need to access ___ and ___ to complete the process. Merchant Center leverages Google Search Console, a product that helps you monitor and maintain your site’s presence on Google, for website verification and claiming. You can verify and claim your website URL without leaving Merchant Center and we’ll associate your website information with Search Console through your Google Account. If you’re familiar with Google Search Console and have already verified your website URL before, you can easily claim it in your Merchant Center account. Which of the following is the correct course of action to take when a product is relevant to two product categories? The 'google product category' attribute indicates the category of the product being submitted, according to the Google product taxonomy. This attribute accepts only one value, taken from the product taxonomy tree. If your items fall into multiple categories, include only one category which is the most relevant. Easy retail-centric campaign management: Instead of keywords, Product Listing Ads use the product attributes you defined in your Merchant Center data feed to show your ads on relevant searches. Browse your product inventory directly in AdWords and create product groups for the items you want to bid on. Sachin has just opened a new Google Merchant Center account and has submitted the required business details under ‘general’ settings. Before Sachin can upload his feed, his website will be checked by Google to ensure it meets some basic requirements. Which of these is not a requirement? Accurate contact information. Your website must display sufficient and accurate contact information, including a telephone number and/or email. Secure checkout process. Payment and transaction processing, as well as collection of any sensitive and financial personal information from the user, must be conducted over a secure processing server (SSL-protected, with a valid SSL certificate - https://). Return policy. Your site must provide a clear and conspicuous return policy to users. Billing terms and conditions. Your site must provide clear and conspicuous billing terms and conditions.Complete checkout process. Ensure users are able to successfully add items to the cart and fully complete the checkout process. In which of the following cases should an advertiser use the ‘identifier exists’ attribute with the value of ‘False’? No unique product identifiers exist: Where unique product identifiers are required but no such identifier exists for an item (e.g. custom goods), submit the 'identifier exists' attribute with a value of FALSE. Product ratings are displayed as a five star rating system with Product Listing ads, but which of the following are legitimate sources of review data that are used to compile these ratings? These star ratings represent aggregated rating and review data for the product, compiled from multiple sources including merchants, third-party aggregators, editorial sites, and users. With a Google Shopping campaign, each ad group can hold up to ___ product groups, and each product group can contain up to ___ levels of product attribute. Each ad group in a Shopping campaign can have up to 20,000 product groups. An advertiser can use up to ___ levels of product attributes within each product group created. You can subdivide up to 7 levels for each product group in any order you want. You can have a product group for all your products and bid the same amount for all of them. In the opposite way, you can also have smaller product groups organized by brand or product category. Keep in mind that you can't set a bid on a product group that has been subdivided--you'll set bids on the product groups without subdivisions. Which of the following formats cannot be used to create and upload a feed to Google Merchant Center account? We are currently unable to accept a feed in the Excel file format (.xls). Shipping: Create and manage your shipping methods. Please be aware that shipping attributes at the product level will override these settings. Learn more about using the shipping tools. What is the file size requirement for a direct upload? Direct upload files must be under 200 MB in size. Which of the following site-level requirements must be met prior to uploading your first product feed? Study Again and Keep Trying!